2R Hardware & Electronics: AM4113T-YFGW Dino-Lite Premier. Discover the smallest fluorescent microscope for observing orange to red fluorescence such as observing RFP with DsRed. Making research no longer being bulky, heavy, expensive or delicate like with a traditional fluorescence microscope. Changing the way you use a fluorescence microscope with its small form factor and high sensitivity to low light. The Dino-Lite Premier AM4113T-YFGW digital microscope is a unique handheld portable microscope that is designed for observation of orange fluorescence such as OFP (orange fluorescence protein) and red fluorescence such as RFP (red fluorescence protein). It utilizes high intensity green LEDs for its excitation light source with a 570nm emission filter. This makes it applicable for research such as visualizing small blood or lymphatic vessels of an organ in microangiography analysis. The image quality obtained with the Dino-Lite is comparable or superior to some traditional fluorescence microscope, but much less to obtain and maintain. It is equipped with a 1.3 megapixel sensor and utilizes a rotatable magnification dial that allows magnification up to 200X depending of working distance, a scroll lock feature for assuring desired set magnification/ focus distance, and a cable strain relief (SR) that holds the Dino-Lite and its USB Cable together for resistance from pulls and twists. There is also a white light switchable by included software for aid in focus and location. 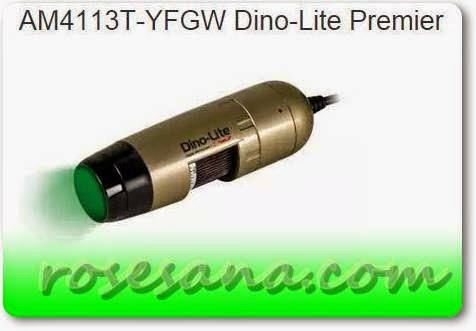 The Dino-Lite Premier AM4113T-YFGW provides a valuable price per performance tool for researchers or users interested in observing orange to red fluorescent specimens. Lighting 7 filtered green LEDs for excitation lighting with 570nm emission filter and 1 white LED switched by software.